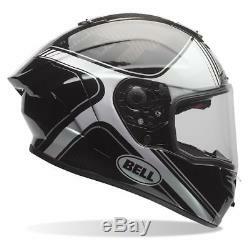 Bell Race Star Tracer Gloss Blk/Wh Helmet. Now with free dark visor. Bell Race Star Tracer Helmet. The Bell Race Star Helmet has been designed for the sport rider and track day enthusiast that demands unparalleled performance. Constructed using the latest in carbon fiber technology and developed through extensive wind tunnel and track testing, the Race Star's design features a superlight 3K Carbon Shell, Raceview ergonomics for unmatched visibility and the three layer Flex Impact Liner to manage slow, mid and high energy impacts. The Race Star continues the racing heritage of the Bell Star line, pushing the limits of helmet technology to all new heights. FIT: The Bell Race Star has a narrow neck roll opening and snug cheekpads to occlude noise and to mitigate movement at high speeds. These padded elements will conform to your unique features by a break in margin up to 20% over time as the foam compresses. FLEX IMPACT LINER: Pro Star and Race Star helmets feature the Flex impact liner, a first-of-its kind, three-layer impact liner designed to manage energy from three potential impact scenarios: low, mid and high-speed. It does this by using three different materials at three different densities. As the impact becomes greater, higher density layers are engaged to manage energy. RACEVIEW: The Star features two unique profile shapes for two distinctly different types of riding. The Raceview profile used on the Pro Star and Race Star uses an orientation specifically optimized for a tucked, more compact position. Conversely, the Streetview profile used for the Star is designed for a more upright, sport or touring position. PANOVISION VIEWPORT: No matter what or how you ride, one factor remains constant: the need for maximum visibility. Whether racing or going on a simple ride in the mountains, the ability to make safe headchecks and see obstacles clearly is critical. The Panovision viewport in the Star offers riders additional vertical and lateral visibility over the previous Star and more traditional viewports. This allows the rider to see better in a tight or tucked position and make saferlane changes and head-checks. VIRUS Cool Jade Power Mesh Liner: The Pro Star and Race Star feature the most technically advanced liner on the market. Designed to withstand the rigors of hard use in extreme conditions, the Virus liner allows athletes to stay cool, keep comfortable and beat the funk. CoolJade fabric from Virus has been infused with recycled jade to create a natural cooling effect. The ultra-wicking construction combined with CoolJade infused yarn decreases your skin surface temperature up to 10° F - keeping you comfortable, dry and cool. 3K CARBON SHELL: The proven 3K carbon fiber on the Race Star gives this helmet the look, performance, and feel of a true race helmet. MAGNEFUSION MAGNETIC CHEEKPADS: Allows for easy removal of the pads for washing and enables emergency responders to easily remove the cheekpads first before removing the helmet following an impact. Virus Cool Jade Mesh Liner. Field tested and developed by working with professional riders on the track. Optimized aerodynamics using Bell's state-of-the-art wind tunnel, the Bell Star's aerodynamics have been fine-tuned with advanced riding simulations. 6 EPS and 5 shell sizes allows a more proportional fit and improved performance, especially at high speeds. Meets or exceeds Snell M2015 and DOT certifications. 21.625 - 23.25. 22.875 - 24.375. Take a look at our feedback. We are a licensed motorcycle dealership for Suzuki, Kawasaki, Honda, Aprilia, Moto Guzzi, Vespa, Derbi & supplier of clothing from Alpinestars, RST, Arai, Shoei, HJC, TCX, Shark, and many more. As well as genuine parts and accessories for all of your motorcycling needs. All items come fully invoiced. You also have the reassurance of dealing with an international industry leader with a trusted reputation built up through honesty & integrity. Our feedback really does speak for itself. The item "Bell Race Star Tracer Gloss Motorcycle Helmet Now £299.00Free Dark Visor" is in sale since Tuesday, January 30, 2018. This item is in the category "Vehicle Parts & Accessories\Clothing, Helmets & Protection\Helmets & Headwear\Helmets". The seller is "wheelsmotorcycles" and is located in Peterborough. This item can be shipped to United Kingdom, Austria, Belgium, Bulgaria, Croatia, Cyprus, Czech republic, Denmark, Estonia, Finland, France, Germany, Greece, Hungary, Ireland, Italy, Latvia, Lithuania, Luxembourg, Malta, Netherlands, Poland, Portugal, Romania, Slovakia, Slovenia, Spain, Sweden, Australia, Canada, Brazil, Japan, New Zealand, China, Israel, Hong Kong, Norway, Indonesia, Mexico, Singapore, South Korea, Switzerland, Taiwan, Thailand, Chile.